It was really nice to see how well Marquette responded last night. Facing a hot Villanova team and a seven point halftime deficit, MU jumped right out of the gate in the second half and held on for the win. In looking at the numbers, this is a game that was actually decided on the offensive end. It's somewhat surprising, especially given that the turnover rate by Villanova (31.2%) was probably a deciding factor. However, both teams posted above average offensive efficiencies, as well as above average effective Field Goal percentages (eFG%). Considering that both teams are in the bottom third of NCAA teams for Free Throw Rate, it's nice that the referees decided to let them play a little bit. When we look at the turnover rates, Marquette had a significant advantage. As we've covered, Marquette does a better job of both protecting the ball and forcing turnovers, and this came into play last night. Villanova turned the ball over roughly one out of every three possessions. Finally, Marquette lost (decidedly) on the Offensive Rebounding factor for the first time in five games. 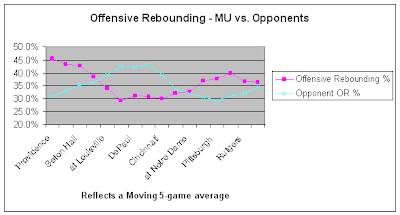 We continue to be concerned with the current trend of Offensive Rebounding Percentage for Marquette. This was a strength for Marquette during non-conference play, and suffered greatly during the first half of conference play. Marquette had started to perform better since the Cincinnati game and was well correlated with improved performance. However, the trends for offensive rebounding percentage are heading in the wrong direction. We can see yet again what a good performance Dominic James had. James had an Offensive Rating (ORtg) better than team average, and a Defensive Rating (DRtg) better than team average. His net points added essentially counts for the entire margin of victory. Acker had a great game, which was statistically his best ever in a Marquette uniform. Lazar had another quietly effective and net positive game for the team. McNeal had a marginal game overall, with an ORtg worse than team average and a DRtg worse than team average too. Despite a contribution of 17.2 points, his net impact was close to zero. In addition, McNeal's usage was at 26%, which is much higher than his season usage of 19.5%. Players get less efficient the higher their usage, so hopefully McNeal will be able to rein it in a bit for the next game and be more productive. Let's not be too harsh, however, because he has been a superstud during our five game winning streak. 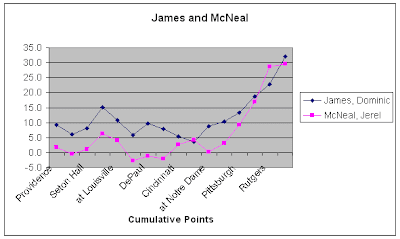 After mostly mediocre performances through much of conference play, the net points trends for James and McNeal are heading up, up, up. A streaking Marquette team = streaking performances by James and McNeal. Hopefully, team and individual performances will continue on this same path this Saturday against Georgetown. There's a lot of time between now and then, so stay tuned for more information here at Cracked Sidewalks. Finally, for more detailed stats breakdown of the game last night, we recommend checking out Villanova By The Numbers. There's a very thorough review of all the stats from last night, and it's well worth checking out. I think it was Acker who was yelling in the huddle during a first half timeout. It worked as it seemed to light a fire in the team. We fought thru the first half, and broke it open in the second half. This was a quality win for MU, and on the road which was a problem for us before the Cincy game. If UConn can lose another game, and MU beat Syracuse and G-Town we'll have a shot at the 4th slot in the Big East. We need the bye at MSG. Wes Mattews Sr. must have you on the payroll. For your stats to rate his son so well, that's the only explanation. He is simply not the same play, and was left on the bench for extended periods. I didn't refer to Matthews once in the Villanova recap, so I'm not sure what you're referring to. His ORtg was worse than the team average. His DRtg was better than the team average. He accounted for 9.7 points produced, which is slightly better than his final box score of 9 points, largely due to three assists. His net points added was 0.8, which is about net neutral. A net neutral impact is far from rating "so well". I think that's a fair characterization of his impact on the game.